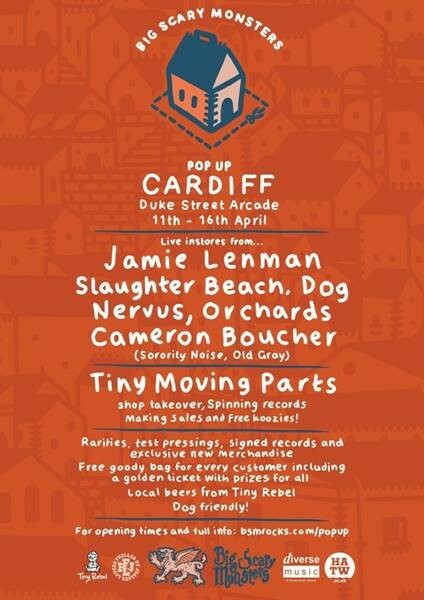 Big Scary Monsters Records are pleased to announce they’ll be bringing their popup shop to Cardiff! Following on from their hugely successful London-based outing in 2017, those righteous folks at Big Scary Monsters Records are pleased to announce they’ll be bringing their one-stop-for-indie-rock popup shop to the fine Welsh capital of Cardiff on 11th – 16th April. To celebrate reaching 200 releases and their sweet 16th birthday, the label opened their first popup shop in East London for two weeks in January 2017. It included in-store appearances from a host of the hottest indie-rock names including Modern Baseball, Kevin Devine, Beach Slang, Gnarwolves, Delta Sleep and Tall Ships, plus a cocktail bar which was setup and run by Tiny Moving Parts, a bring-your-dog day, live screen printing, a few hundred beers, and loads of lovely customers. Now, continuing their mission to spread their love of independent music culture to the masses, the label will be rocking up to Cardiff this April bringing a whole host of goodies and surprises. The perfect opportunity for vinyl-obsessives to grab the latest limited edition releases, the shop also serves as a hangout spot and music-lovers paradise boasting a very special schedule of in-store appearances, including a full shop takeover from Minnesota’s Tiny Moving Parts and tour support buddies in Brighton math-pop newcomers Orchards. Tiny Moving Parts are set to play Cardiff on 12th April on their latest headline tour, with their recent US tour sold out and this EU run looks set to do the same, all in support of their new album Swell released recently. The band will be giving away free TMP beer koozies to the first 25 ticket holders for their show on the 12th to turn up to the shop. Elsewhere on the schedule, following tours with Creeper and Milk Teeth, Em Foster of Nervus will be making a solo appearance playing tracks from their new album, whilst – nipping in during an EU tour with Tigers Jaw – Slaughter Beach Dog (aka Jake Ewald of Modern Baseball) will be making his only solo performance of the tour, and also the first ever SBD show in Cardiff. Later in the week ex-Reuben front man Jamie Lenman follows a packed out Cardiff show on his February tour with a very special one-off solo appearance, and Sorority Noise/Old Gray member Cameron Boucher will also be making an exclusive solo performance, taking time off from Sorority Noise’s tour with The Wonder Years. Alongside all this, there’ll be all sorts of giveaways and surprises planned including festival ticket giveaways from the likes of fan-favourites 2000 Trees and ArcTanGent. Commenting on the event, the label said: “After the success of our popup shop in London last year, we wanted to go even bigger this time around, but to somewhere we haven’t really trod ground before. It’s easy to forget that our little corner of the music scene doesn’t just revolve around London, and that actually a lot of our bands and fans are from all corners of the UK. So, we wracked our brains: where else has a vibrant music scene? Where else will have most likely heard of Big Scary Monsters, but isn’t in England? Where else has a fabulous castle right in the city centre with ace music venues nestled around its border? Well, Cardiff of course! As one of the UK’s best loved independent record labels, over the years BSM has been home to a frankly knee-quaking and palm-sweat-inducing array of incredible artists including the likes of Andrew WK, Balance & Composure, Beach Slang, DZ Deathrays, Gender Roles, Gnarwolves, Hell is For Heroes, Jamie Lenman, Kevin Devine, La Dispute, Lemuria, mewithoutyou, Modern Baseball, Reuben, Tall Ships, The Fall of Troy, TTNG and many more.